I began my career as an educator as an outdoor educator. Now I teach educational technology. Given both the ever increasing sedentary and indoor lives of kids and the advancement of technology, the time is ripe to combine the two. Learning should extend beyond the classroom walls. Outdoor education is good for students and adults. 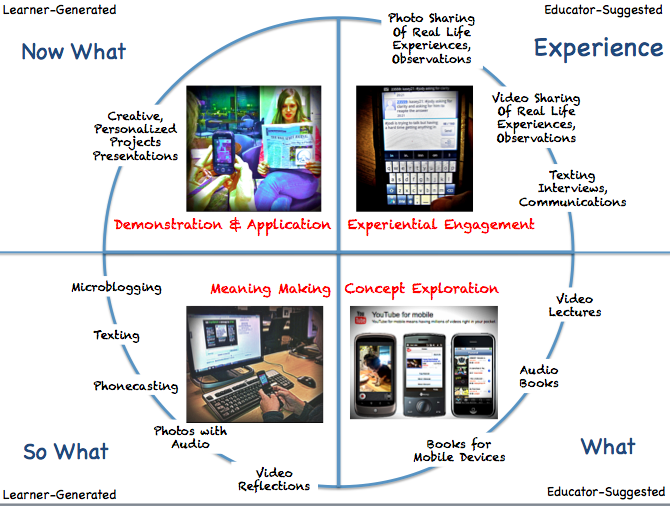 Mobile technology is engaging and interesting; and can create authentic and relevant learning experiences. Mobile learning should be just that – mobile. Learning outside the classroom is about raising young people’s achievement through an organized, powerful approach to learning in which direct experience is of prime importance. This is not only about what we learn, but most importantly, how and where we learn. It is about improving young people’s understanding, skills, values, personal and social development and can act as a vehicle to develop young people’s capacity and motivation to learn. Real-world learning brings the benefits of formal and informal education together and reinforces what good educationalist have always known: that the most meaningful learning occurs through acquiring knowledge and skills through real-life, practical or hands-on activities. tackles social mobility, giving children new and exciting experiences that inspire them to reach their true potential. These real world experiences raise aspirations, equipping young people with the skills they need to become active and responsible citizens and shape a fit and motivated workforce. addresses educational inequality, re-motivating children who do not thrive in the traditional classroom environment, such as those from disadvantaged backgrounds or with Special Educational Needs. Young people who experience learning outside the classroom as a regular part of their school life benefit from increased self esteem, and become more engaged in their education both inside and outside the classroom walls. supports improved standards back INSIDE the classroom, raising attainment, reducing truancy and improving discipline. Learning outside the classroom is known to contribute significantly to raising standards & improving pupils’ personal, social & emotional development. Find out more about research studies which reinforce and illustrate the wide-ranging benefits for young people on our research pages. Mobile devices can form an engaging platform for teaching and learning, with the potential to expand the realm of the classroom. Functionality and context are key considerations when selecting from the myriad of mobile-enabled web sites and applications. The portability and convenience provided by mobile devices enables instantaneous, contextual observations in the field or whenever spontaneous learning opportunities arise. Collecting information outside the classroom can help students hone observation and collaboration skills, reinforce topic relevancy, or provide opportunities to emulate an expert system through use of the apps. GPS-based apps for mapping, geo-blogging, and geo-tagging are especially powerful in this regard, because they enable direct linking of observations to specific times and locations. The ability to capture, reference, and share data, multimedia, and ideas within a spatial or temporal context helps students identify broader trends and relationships, foster discussion, and develop conceptual thinking. Mobile devices such as smartphones and tablets are powerful tools for outdoor study. Access to the Internet, a camera and geospatial data (e.g. GPS) make it easy to gather, organize and submit data from observations. 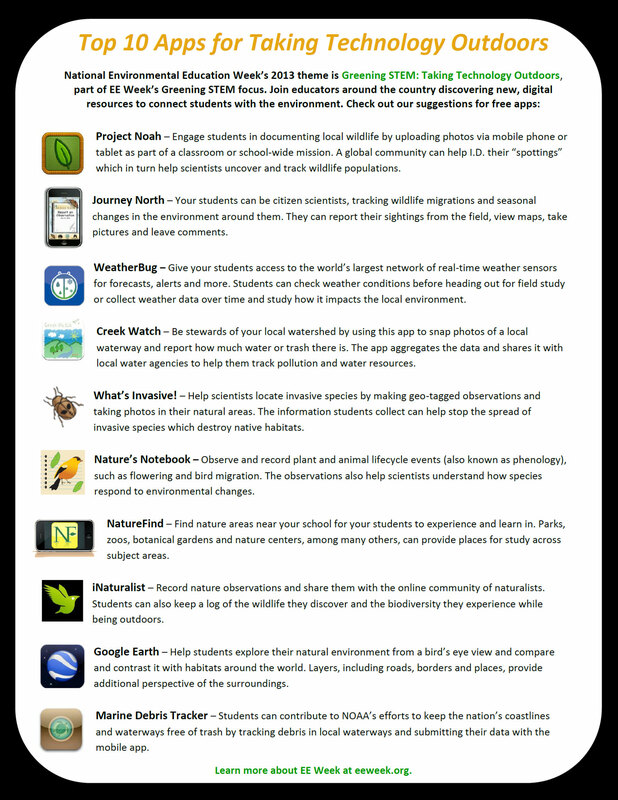 Applications (apps) can be downloaded to engage students in citizen science activities, like identifying wildlife. GPS (Global Positioning Systems) is a technology that communicates with satellites to pinpoint specific locations on Earth. GPS units are great tools for getting students outside and engaged in environmental field research and service-learning projects. At Wisconsin’s Augusta Area School District, teacher Paul Tweed engaged his students in several projects that used GPS and GIS (Geographic Information Systems), one of which helped the Wisconsin Department of Nature Resources (DNR) track orphaned black bear cubs released into the wild. Students can use digital cameras to document their local environment, track their progress on science projects, collect evidence and present their findings in the classroom. Students at Monroe City Schools in Louisiana use tech tools like digital cameras to enhance environmental education programs at Black Bayou Lake National Wildlife Refuge. Learn more at: fws.gov/northlouisiana/blackbayoulake/environmental_education.html. Digital weather stations are small monitoring devices put in place to collect real-time weather data. They can be installed near home, school or in nearby parks, enabling students to add weather conditions to their study of the local environment. Students participating in outdoor education programs with NatureBridge check digital weather stations at Olympic, Yosemite and Golden Gate National Parks for weather data to add to their field research. Learn more at: naturebridge.org/your-naturebridge-program-olympic. 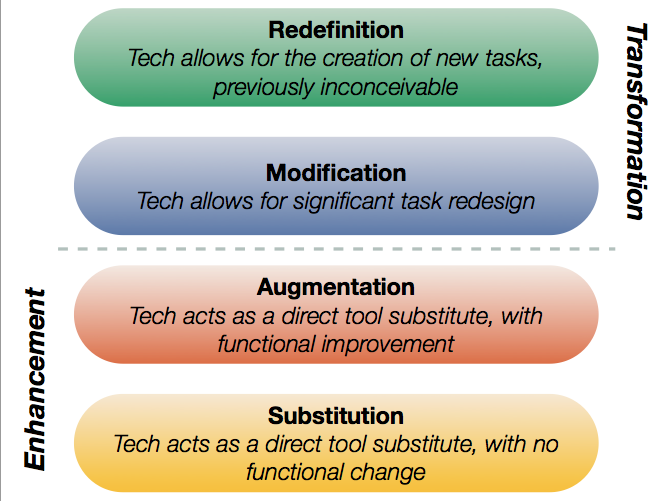 The SAMR model (http://www.hippasus.com/rrpweblog/) is being used to discuss technology integration. 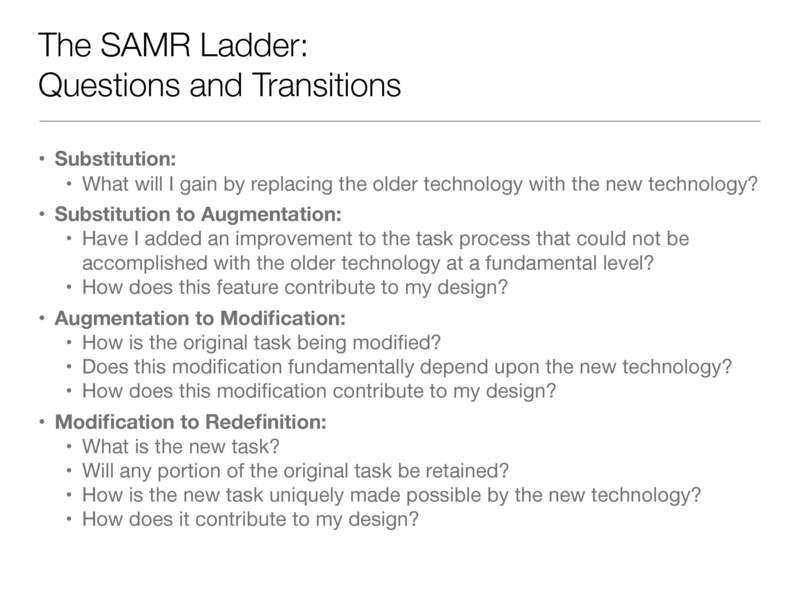 The SAMR model, developed by Dr Ruben Puentedura, aims to support teachers as they design, develop and integrate learning technologies to support high levels of learning achievement and student engagement. It becomes apparent that these outdoor-based mobile learning activities can be categorized in the transformational levels of modification and redefinition as learners engage in tasks that are uniquely possible given the mobile technologies. Zoom: Communicating Perspective is a new mobile learning activity added to those found at Mobile and Technology-Enhanced Experiential Activities. This website describes mobile learning and technology-based activities that facilitate a sense of community in a variety of educational and training settings. They rely mostly on texting, emailing, and photo-taking activities. Free, group sharing internet sites are also used which require access to the Internet via a smartphone or computer. Sites such as Flickr Photo Sharing, Google Docs, and Web 2.0 tools supplement some of the activities. To build communication and problem solving skills. To understand and develop perspective taking. To build visual literacy skills. 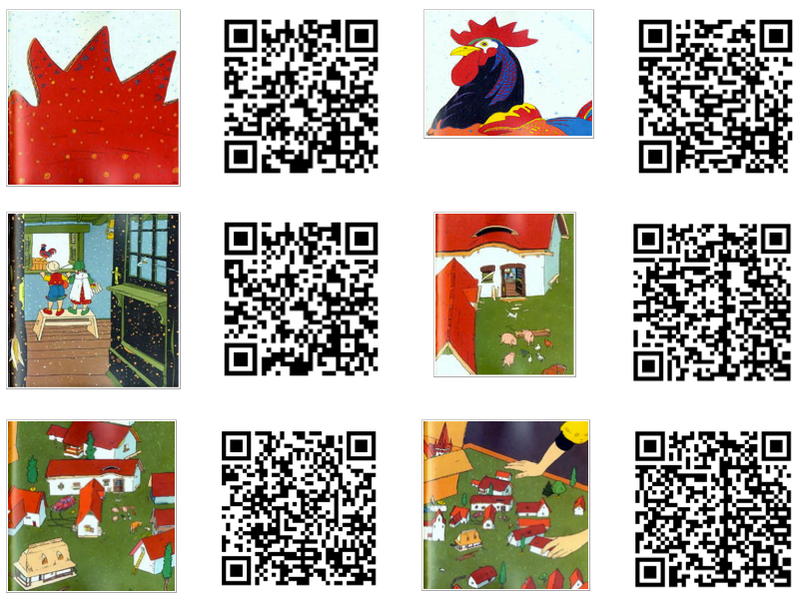 This game is based on the intriguing, wordless, picture book “Zoom” by Istvan Banyai which consists of sequential “pictures within pictures”. The Zoom narrative moves from a rooster to a ship to a city street to a desert island and outer space. Zoom has been published in 18 countries. 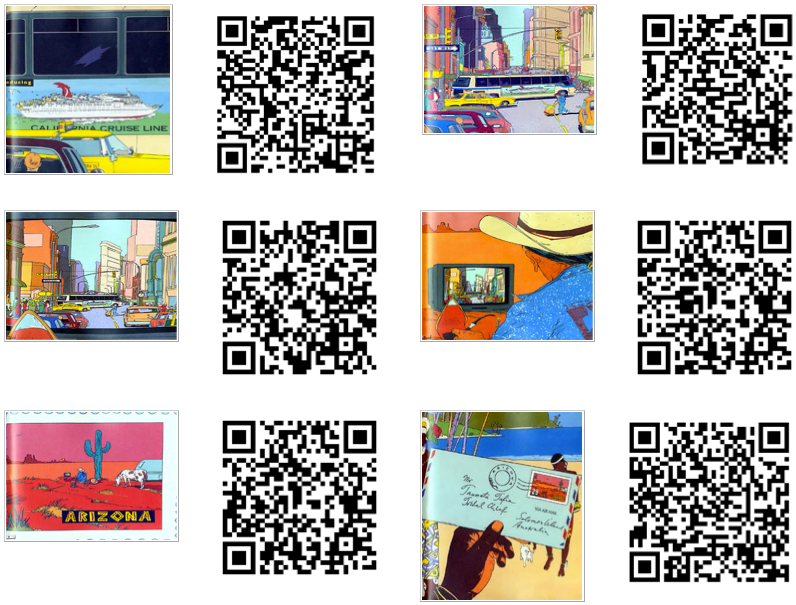 Hand out one QR Code/Image (see below or the original post via the link above for a downloadable PDF) per person/per pair (make sure a continuous sequence is used). 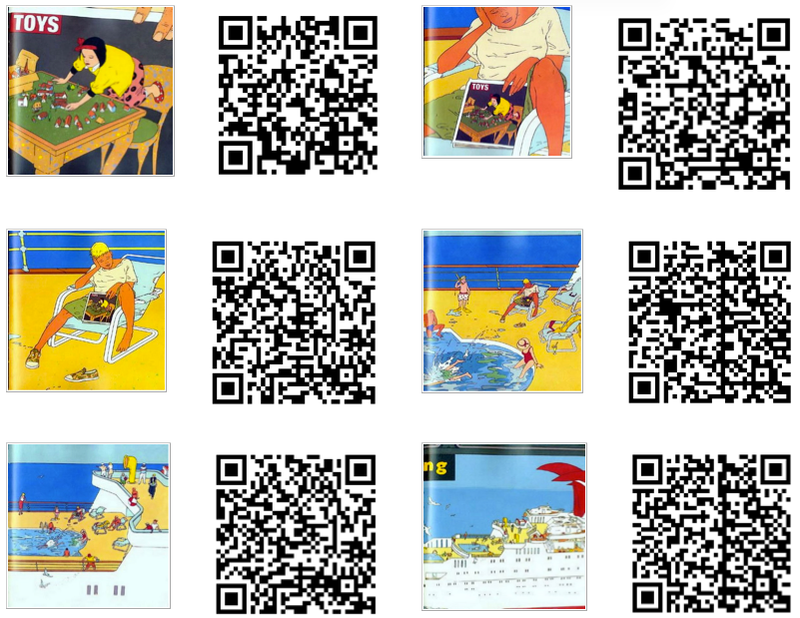 After QR codes are distributed and images are accessed, tell participants may only look at their own pictures and must keep their pictures hidden from others. Encourage participants to study their picture, since it contains important information to help solve this challenge. The advantage of using mobile devices is that learners can zoom in on details of the image. It is the facilitator’s choice whether or not to tell learners this. The challenge is for the group to sequence the pictures in the correct order without looking at one another’s pictures. They are to use only verbal communications to describe the images they have. When the group believes they have all the pictures in order, they can indicate so and the pictures on the mobile devices can be viewed by everyone. Share the book or the following video so they can see the level of correctness in their order. A follow-up discussion can include characteristics of effective communication, how perspective affects how we see and communicate, using visuals to communicate. I developed a mission statement as an educator several decades ago. It is simply, “To provide students with the knowledge, skills, and passion to become lifelong learners.” I have never swayed from that mission, but as I say in my Twitter profile, “I don’t do education for a living, I live education as my doing . . . and technology has amplified my passion for doing so.” Technology makes possible 24/7, interested-driven learning. I teach online so I get the opportunity to learn everyday all day long due to the Internet and social networks. Students of all ages and settings should also be given the skills, tools, and time to engage in this type of self-directed, passion-based learning. Higher education and high school teachers have stubbornly kept lectures as the primary mode of instruction. Most students in these venues report boredom as a result. I discuss this more in Who Would Choose a Lecture as Their Primary Mode of Learning. An opposing state of being passionate is being bored, a contradiction to my mission statement . . . and I believe that most educators would report that do not wish to elicit a state of boredom in their students. This is why I am confused that in these amazing times of the abundance of information, mobile devices, and free technologies, educators are not leveraging them in the classroom. Reports continue to be disseminated about how young people are using technology. These devices, tools, and strategies can be integrated into existing lessons to enhance the learning activities and create more engagement, excitement, and possibly some passion among the students. A nationally representative phone survey of 1,005 adults (ages 18+) was taken August 2-5, 2012. The sample contained 799 internet users, who were asked questions about their online activities. 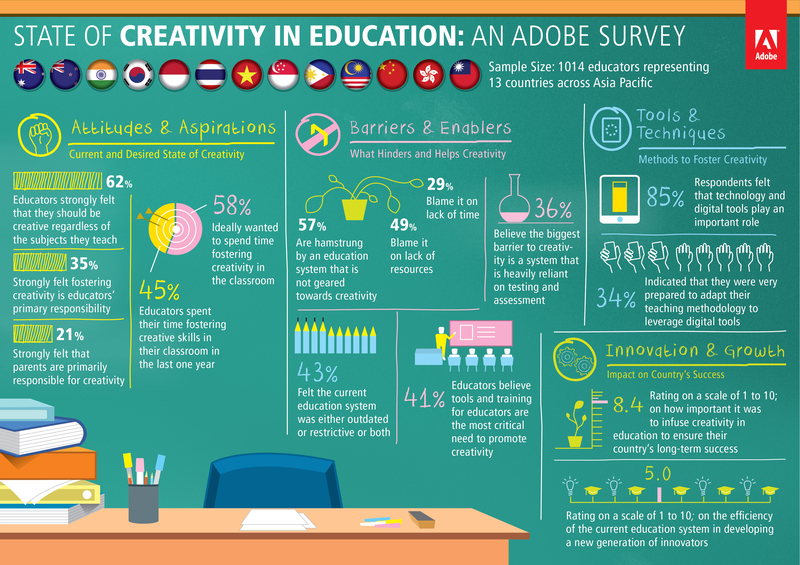 Based on the results of the survey, recommendations are made how these online activities can be leveraged in the classroom. Taking photos and videos are commonplace for many young people. 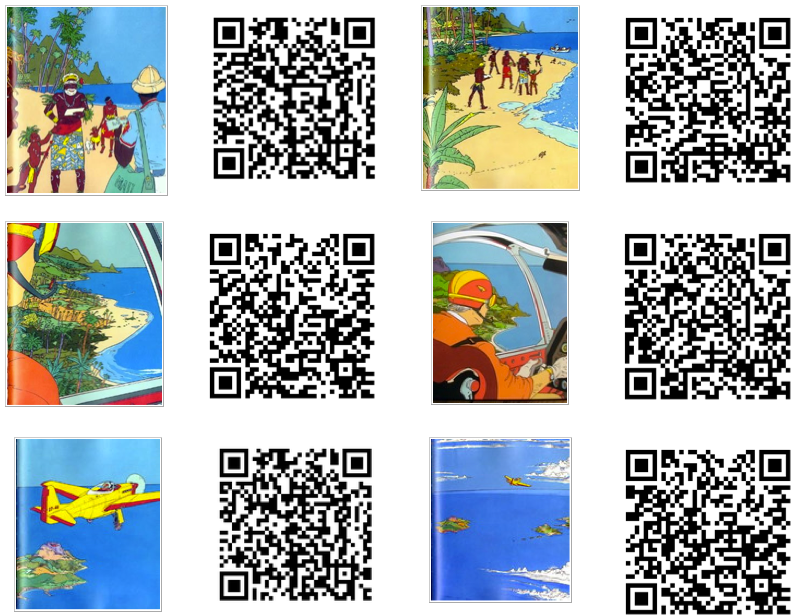 Students can demonstrate their learning through some form of visual media. Using visual media in the classroom is congruent with brain research about the power of vision in learning (as per neuroscientist, John Medina) and supports research that visuals enhance learning. How can I use Content Curation in My Class? Students Becoming Curators of Information? There are limitless ways to use student devices during class time. I recommend to educators to take what they are already doing well in the classroom and brainstorm how these learning activities can be enhanced using their mobile devices. Pockets of institutions, administrators, and educators are successfully integrating the tools and strategies discussed above into their setting. More blog posts, case studies, journal articles, and news pieces about these initiatives can give permission and suggestions to those who are willing but scared or a bit reluctant. Connecting people’s names and faces is a first big step to forming bonds. 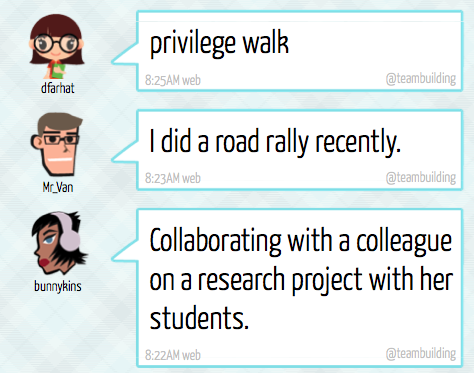 Students need non-threatening, interesting ways to begin creating online community. 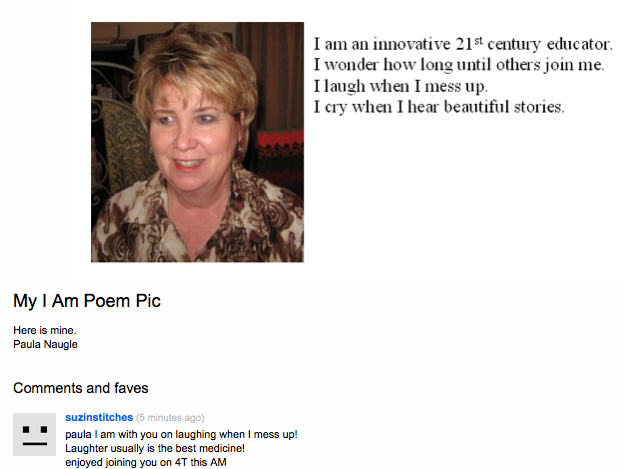 I have used the I Am Poem in a face-to-face undergraduate course (see https://usergeneratededucation.wordpress.com/2012/02/01/mobile-driven-identity-activities/). For this summer semester teaching online courses on Integrating Technology Into the Curriculum for the Boise State Educational Technology graduate program, I asked students to do the I Am poem as one of their first course tasks. 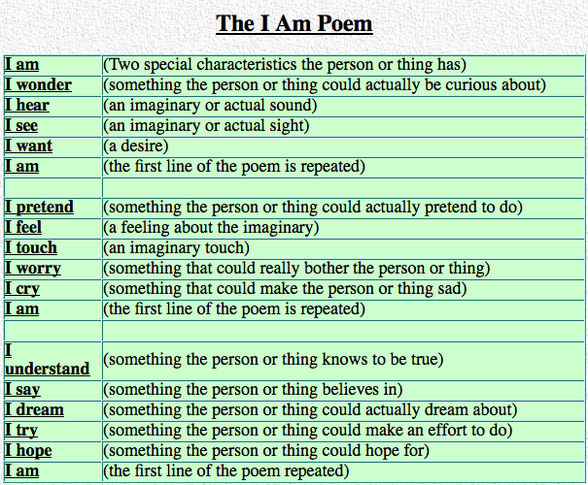 Write an “I Am” poem using the template, either electronically – http://ettcweb.lr.k12.nj.us/forms/iampoem.htm or through the template below to write your own poems. Once your poem is written, locate or take a photo via one of your computer devices that symbolizes who you are, the essence of your poem. 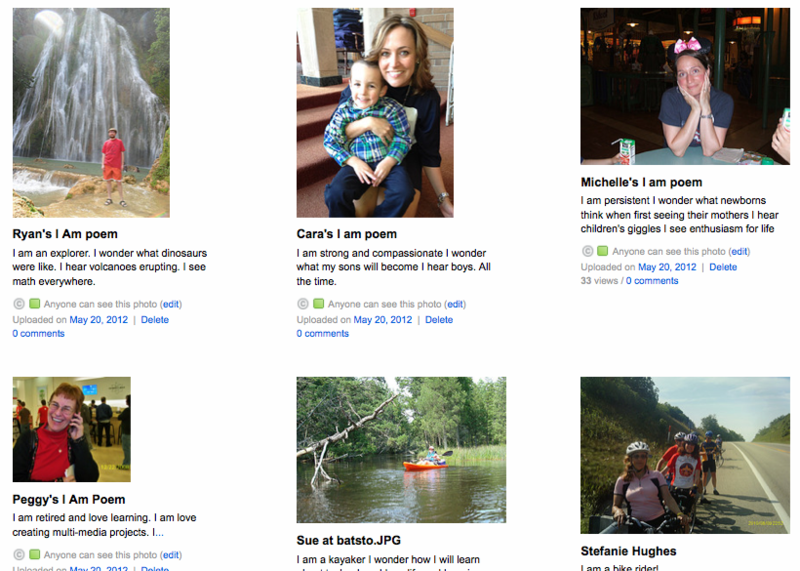 Send your photo to Flickr along with your first name in the subject line and your I Am Poem in the email body to (email to my Flickr account – randomly generated by Flcikr). Since all the group’s images will be sent to this single Flickr account, you can view each other’s poems via the Flickr account http://www.flickr.com/photos/78773858@N03. You do NOT have to have a Flickr account to submit your I Am Poems nor to view other students’ pictures/poems, but if you want to comment on a photo/poem (not required), you will need to have an account. A full description of this activity can be found at http://community-building.weebly.com/i-am-poems.html. Here you can find more directions how to set up the activity for your own class. 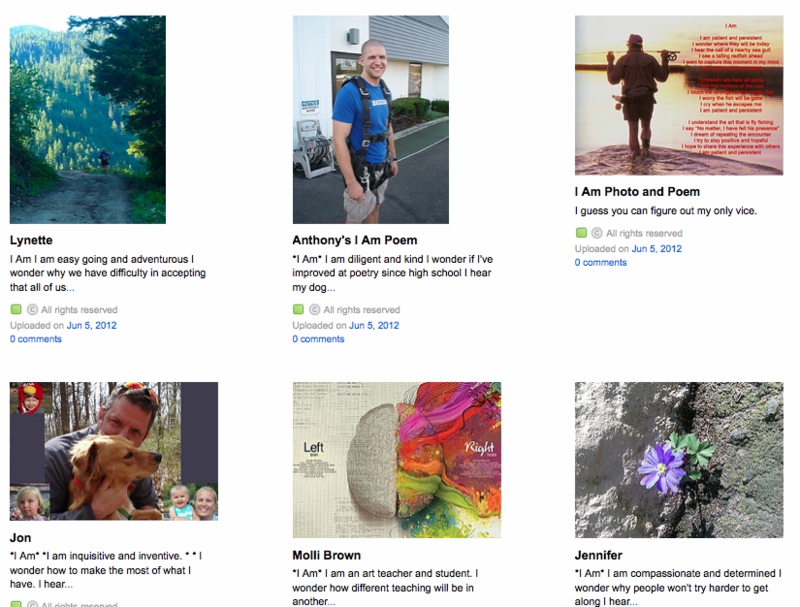 Here is a screenshot of the Flickr page of student submissions. I love the diversity and creativity they demonstrated both through the images selected and poems written. Once your poem is written, locate or take a photo via one of your computer devices that symbolizes who you are, the essence of your poem. It does not have to be a picture of you. It can be a symbol. Create a slide that includes your poem/image. You can include your name or not – it is your choice. Add it to the class Google presentation at https://docs.google.com/presentation/. . . . This is the editing version. Please make sure you choose a blank slide. Google automatically saves any added content. The presentation version can be found on the Moodle homepage. Look for your slide once you add it. I have jumped onto the Flipped Classroom craze to take the opportunity to propose and discuss an experiential model of education (ala John Dewey and Kurt Hahn), one that has experience at its core and provides learning options for all types of learners. 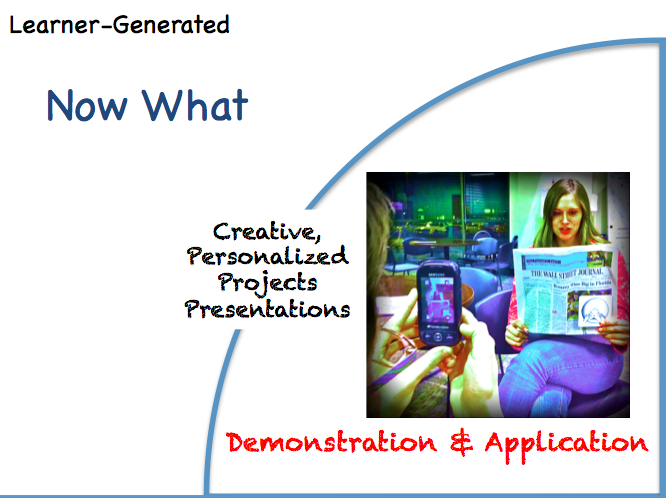 In this model, the videos, as they are discussed in the flipped classroom. support the learning rather than drive it. This post continues the series by providing an overview of The Flipped Classroom: The Full Picture using mobile devices. Each phase of the model has suggestions and ideas for mobile-driven learning activities which can be implemented on most devices. This supports Bring Your Own Devices programs and increases the chances students will use similar learning activities on their own devices outside of the classroom environment. It also is the basis of my teaching philosophy – to provide access to learning regardless of learning differences, income, digital access, and geographical location. Most students own mobile devices that have photo and video taking capabilities, and have Internet for content access. The mobile activities described for the model below take advantage of these functions. The lesson or unit begins with an authentic, engaging, often multi-sensory and often hands-on experience. Its purpose is to hook and motivate the student to want to learn more about the topic. Photo and/or Video Examples of Real Life Situations. One method to do so is to ask students to locate evidence of the learning topic in their immediate environments and record that evidence via a media sharing sites such as Flickr or Youtube. Both of these sites generate (random) email addresses that can be given out to students so they can upload their photos or videos to the educator account. Students do not need email accounts. The media is then aggregated onto the educator account. For example, at the beginning of a unit on personal identity, I asked students to take photos of their core values and upload them to my Flickr account – see Picture Our Values. This description also includes directions how to set up a Flickr account for a class project. Texting Observations, Questions, Two-Way Communications. Students can use their texting functions to interview one other, discuss real world observations made, and report on real life experiences based on suggestions provided by the educator. There are so many ways to get students excited about the content topics especially when asked to use their mobile devices to do so. 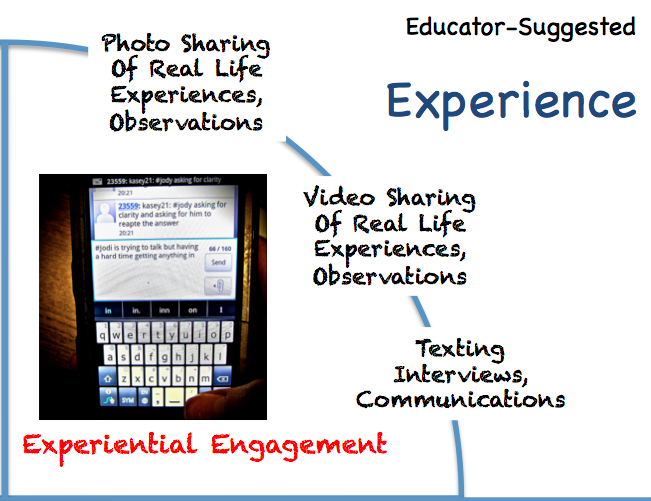 My advice to educators is to take the best experiential activities they have done and/or experienced and include a mobile element as I did with the activities above. During this phase, learners explore the theoretical concepts related to the topic being taught. This is the phase where videos, such as those being discussed in relation to the more popular articles and posts about the flipped classroom, are used in the lesson. To make the content more accessible, as per Universal Design of Learning, a multimedia learning environment needs to provide multiple, flexible methods of presentation. It is important to include content material presented in a variety of formats including ebooks, audiobooks, and content-rich websites can serve this purpose. 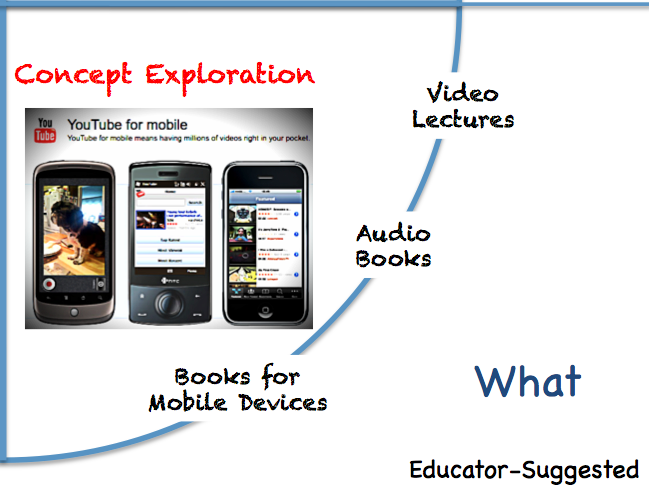 Video services such as Youtube which features Youtube Education has several mobile options, Youtube for Mobile. Students will need to have internet access. The key to this phase, to the use of these materials, and why it is called the flipped classroom is that content resources are recommended to the learners, and then they review them during the own time frames, sometimes as homework. Learners should, often need, to be given the opportunity to reflect on what they experienced and concepts explored during the previous phases. For learning to be meaningful, they need to construct their own meanings and understandings of the concepts covered. Microblogging with Twitter using hashtags. This is the integration phase where students demonstrate what they learned and how they will apply it to other areas of their lives. This can be viewed as a celebration of learning where students create a project that represents their key learnings, significant experiences, and commitments-contracts for post-lesson implementation. 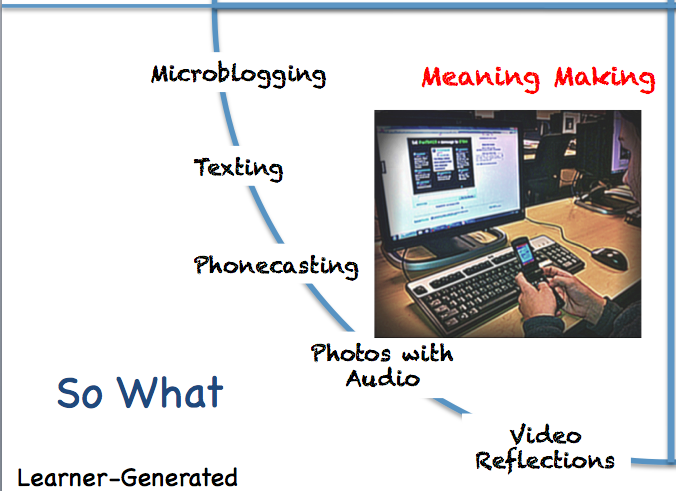 I discussed ideas for using Web 2.0 for this phase in Technology-Enhanced Celebration of Learning. Many of these strategies can work on the students’ mobile devices. The following is TJ’s example from an undergraduate course on interpersonal relations. He used his skills at the Minecraft game and the webcam on his laptop to demonstrate what he learned. What is especially relevant about this demonstration is that TJ has a mild form of Asperger’s Syndrome.